Never Stop Traveling has collaborated with Expedia.com to share some of best things for travelers to do with kids in Atlanta. While traveling with your kids or grandkids is a wonderful experience, there’s always the problem of finding things of interest to everyone. The problem is exacerbated when you have both young kids and teenagers in tow. If that’s the case, you may want to set your sights on Atlanta for a long weekend getaway, since there are plenty of Atlanta attractions of interest to both younger children and teenagers, as well as adults. It’s a sophisticated city with many exciting things to do in a reasonably small area, and also easy to drive around. Fortunately, Atlanta is also home to an array of hotel options to make your stay as comfortable as possible. Start your tour at 21-acre Centennial Park smack in the middle of downtown Atlanta. Built for the 1996 Olympic Games, the park is the park is a center for festivals and concerts throughout the year. It’s also the hub for several great kid activities, including a tour of CNN and visits to The World of Coca-Cola and the Georgia Aquarium. Adults and children over the age of 12 can also join the HLN Morning Express Tour ($47 per person) and meet host Robin Meade. 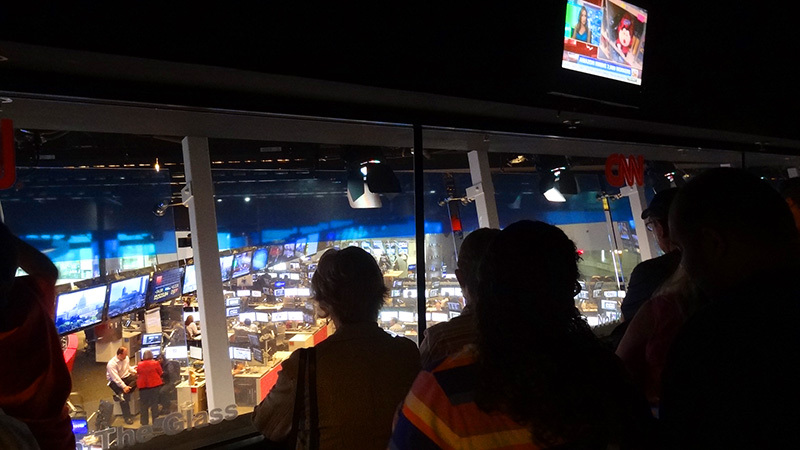 Unlike the Behind-the-Scenes Tour, this tour allows you to visit the studio and HLN control room. Tours take place only on Thursday mornings, and you must make a reservation. According to CNN background checks are conducted on each tour participant. When you leave the CNN building, it’s only a 10-minute walk to The World of Coca-Cola and the Georgia Aquarium, neighbors at the other end of the park. When I walked through the park after a CNN tour, I saw that many from the tour were also headed in the same direction. The World of Coca-Cola is one of the most popular, if not the most popular, things to do in Atlanta with kids. The tour begins with an excellent animated movie, after which you take a self-guided tour so that kids can take their time. 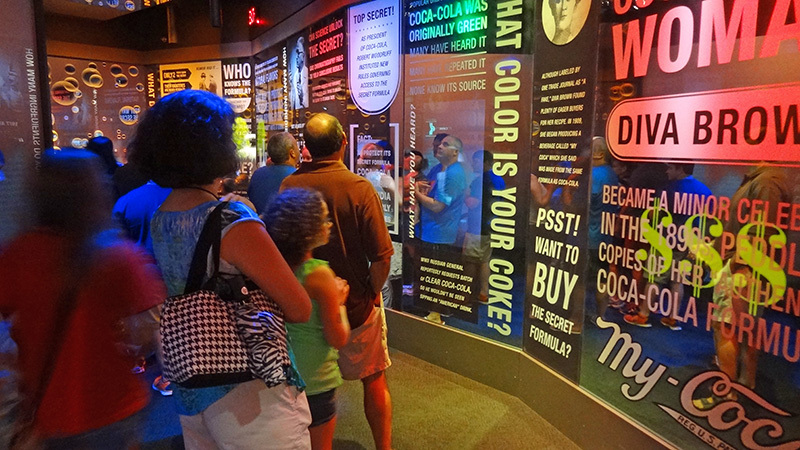 In “The Vault,” in which the guides assure you the secret recipe is kept, you’ll see an exhibition on Coke “Myths and Legends” as well as learn about Coke’s history and other things. The two most popular areas come at the end of the tour: a sampling area containing Coke products from all over the world and the Coca-Cola store filled with just about everything that could have the Coca-Cola name emblazed on it. It was quite crowded, and business was brisk, especially with the foreign tourists. Tickets range from $13 -$17. A few minutes walk away is the astonishing Georgia Aquarium, by far the world’s largest, and one of the most incredible Atlanta attractions. 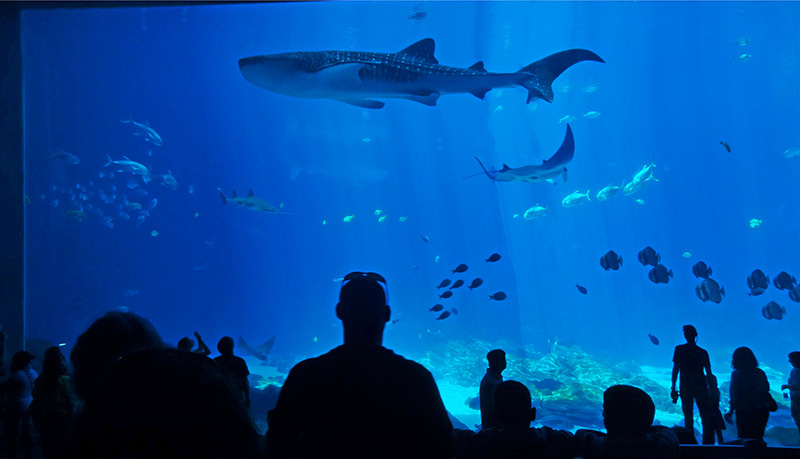 You’ll find your visit here to be an unbelievable experience, almost like being in a theater with a presentation going on all around you as you walk through the mammoth tank. The only difference is that in this presentation the actors are sharks, whales and countless other types of fish. 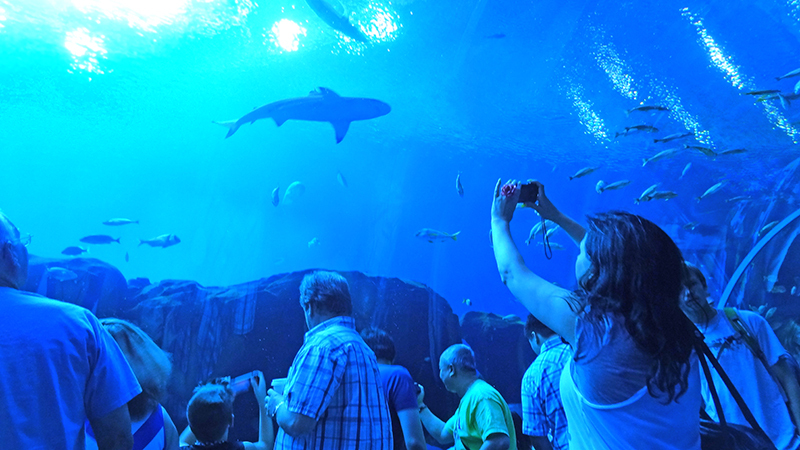 There are many different exhibits in the aquarium and in addition to the walk-through Ocean Voyager, I was entranced by Coldwater Quest where Beluga whales fascinated me. It incorporates a floor-to-ceiling glass wall in front of which people sit seemingly forever. You soon understand why, as you also become mesmerized by the stunningly beautiful and relaxing sight of being so close to these giants of the deep, and the impact of it all is incredibly calming. If you have young children (eight and younger), you may want to visit the Children’s Museum of Atlanta. It’s on Centennial Olympic Park Drive adjacent to Centennial Park, and only a few minutes walk from the aquarium. 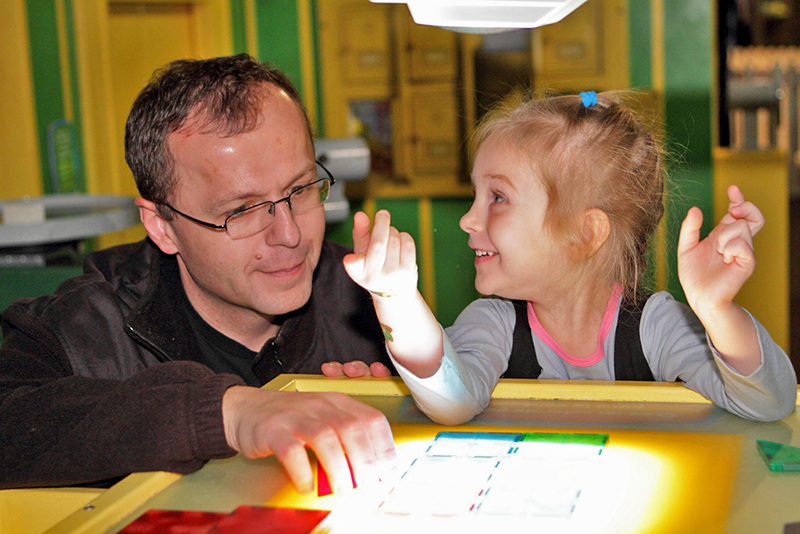 Since the purpose of this museum is to let children learn through playing, activities here engage a child’s senses. They’ll play in a magical castle, paint in an art studio, and find places to climb about and explore. Entrance fees vary from $12.95 to $18.95, depending on the day of the week. Entry is free from 1 pm to 6 pm every second Tuesday of the month. 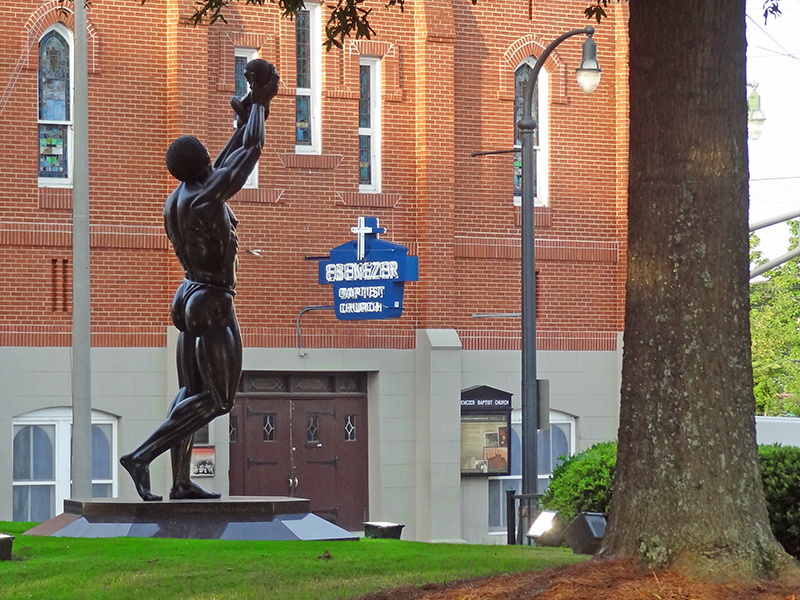 If you want to teach your children about Civil Rights, take a 15-minute drive from Centennial Park to the Martin Luther King National Historic Site, which is a unique Atlanta attraction. It’s also fee free. Administered by the National Park Service, the 35-acre complex is a tranquil and dignified place, built as part of the neighborhood and not looking as monumental as one might expect. The tomb of King and his wife is set in a simple pool next to the old Ebenezer Baptist Church, where King was a pastor, with a modern new church across the street. The Atlanta History Center is a surprise to many since it is a wonderful, multifaceted complex and not a boring museum reciting the history of the city. Among its exhibit of interest to children is its Folklife Gallery showing how folk arts shaped traditions in the changing South. On the museum’s 32 acres you’ll also find the fascinating 1860 Smith Family Farm. 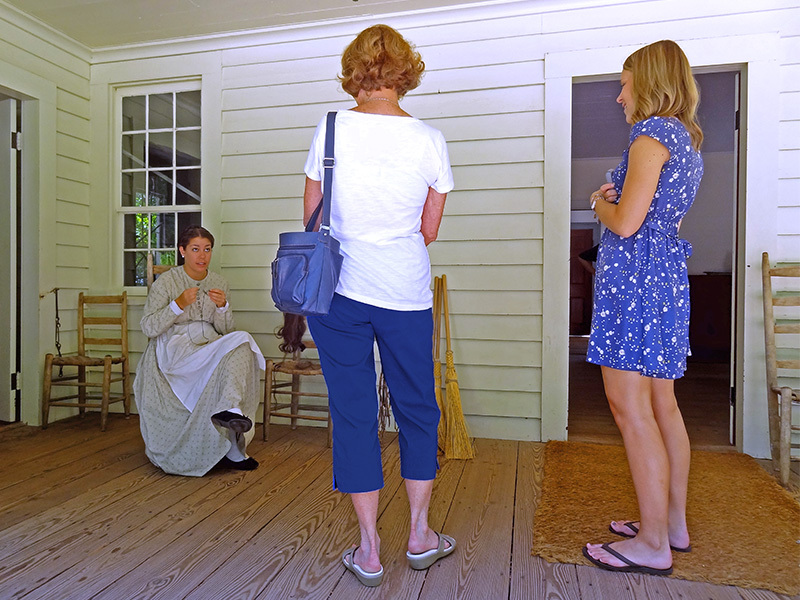 Costumed staff demonstrates homesteading skills, including dying, weaving, carpentry and blacksmithing. Have the kids help with the sheep. Also leave time to visit the center’s interesting exhibition “Turning Point, the American Civil War,” one of America’s most significant Civil War exhibitions, which in a personal way explains the impact the Civil War had on people’s lives both in the North and the South. It is not pro-South, nor pro-North, but pro-education. Ticket prices range from $9 to $21.50. 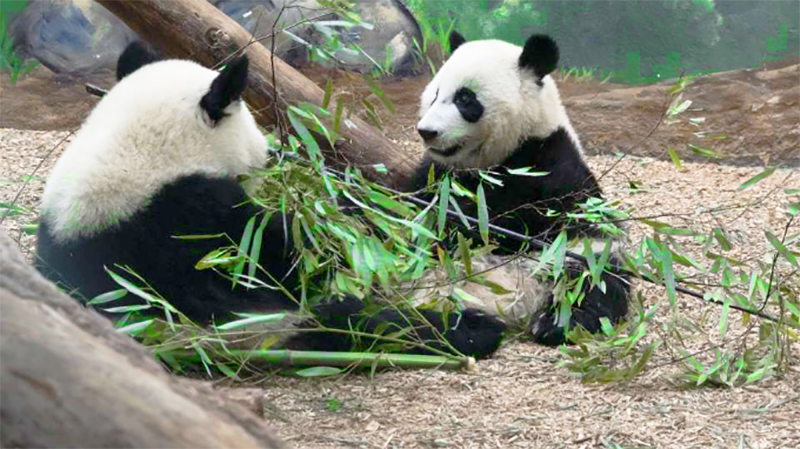 At Atlanta’s zoo – only a 20-minute drive from the center of the city – the star attraction is the giant pandas. Zoo Atlanta is one of only four places in the U.S. where you can see them, and they are a huge draw. As you might guess, it’s one of the most popular things to do in Atlanta with kids. (If you want to psych the kids before you visit Atlanta, have them watch Zoo Atlanta’s live PandaCam). In addition to the pandas, there are plenty of other animals here, as well. There are more than 1,300 including a large group of gorillas, lions, rhinos, and a large display of reptiles, among others. Don’t forget to feed the giraffes. Ticket prices range from $16.99 – $22.99. 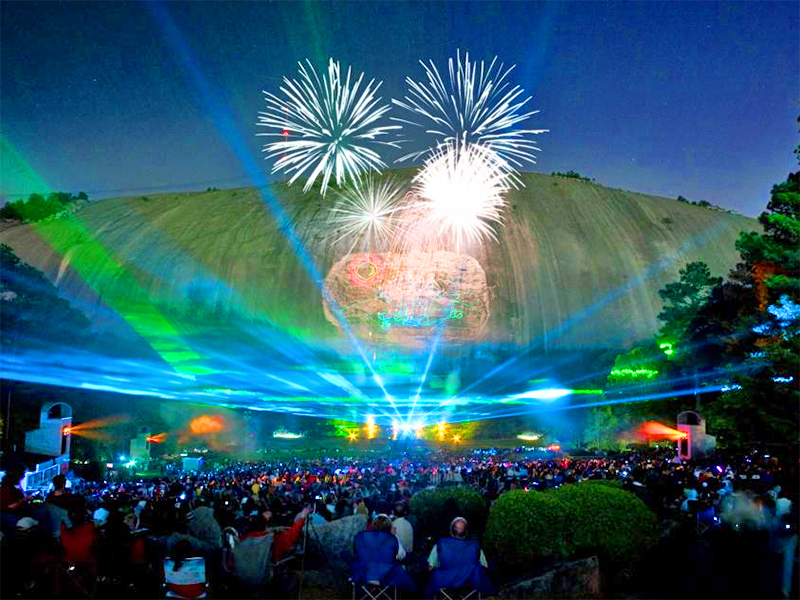 Although this Atlanta attraction is a bit further out ¬– about a half hour drive from downtown ¬– you’ll find the 3,200-acre Stone Mountain Park, Georgia’s most visited attraction. The park offers adventures for all age groups – laser sky shows at night, hiking trails, suspended rope bridges across geysers, a train ride, and more. Take the Skyride, a high-speed Swiss cable car, for a grand view of things or make the one-mile hike up the mountain. In the winter there’s sledding on the mountain (for a fee). Ticket prices vary depending on activities and time of year. 1000 Robert E Lee Blvd. Only about a 15-minute drive north of Centennial Park, the Center For Puppetry Arts is one of the largest museums in the world dedicated to puppetry. Its collection includes more than 200 puppets from around the world. It isn’t just an ordinary collection of puppets, however; it includes the majority of Jim Henson’s (of The Muppets fame) collection. 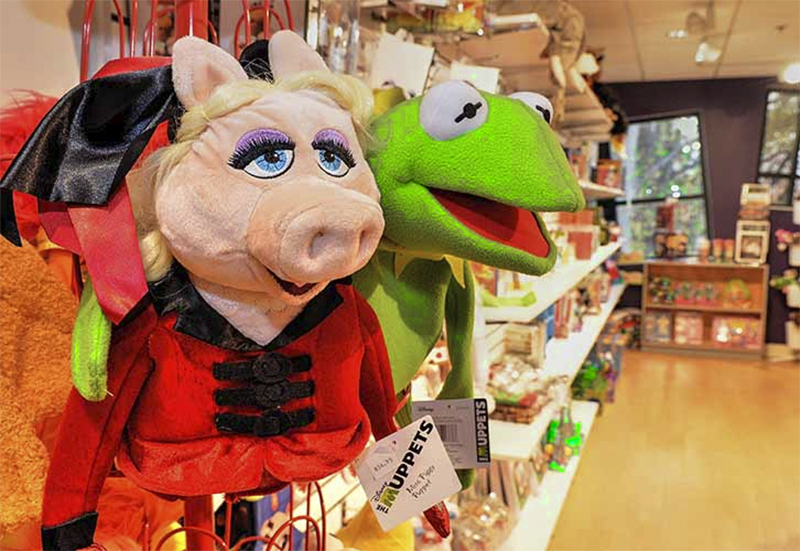 So while you’re looking for great Atlanta attractions for the kids, why not bring them over to meet Kermit and Miss Piggy. Best yet, it’s also one of the things to do in Atlanta with kids that isn’t age-specific (you’ll probably like it, as well). As you might expect, the Center also offers performances in its theater, with themed shows at holiday time. Ticket prices vary depending on the program series.